← Un Estudio Histologico de Músculos en La Poliomielitis. You Are There 1955: Ending Polio will be open at the Eugene and Marilyn Glick Indiana History Center, located at 450 W. Ohio St. in Indianapolis until Saturday, Sept. 14, 2013. Mention you read this HistoricIndianapolis.comarticle at the Welcome Center and receive free admission through Saturday, September 14, 2013. For more information about Indiana Historical Society and the Indiana Experience, call (317) 232-1882 or visitwww.indianahistory.org. During the 20th century, polio was considered one of the most frightening public health problems in the United States. Annual epidemics became increasingly more devastating, paralyzing and killing thousands of children every year. During this time, many efforts were focused on combating the epidemic, but there was little success until Dr. Jonas Salk discovered a vaccine that showed promise toward preventing polio in exposed patients. In 1954, The National Foundation for Infantile Paralysis (NFIP) embarked on a massive effort to pay for the cost of testing and producing Salk’s vaccine at one Canadian and five U.S. pharmaceutical companies. 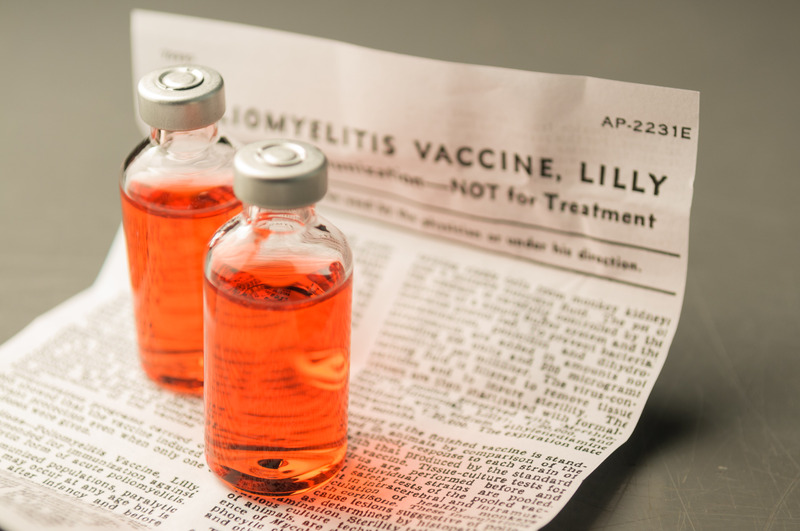 Eli Lilly and Company was one of those that began mass production of Salk’s vaccine in anticipation of the trials and their successful results. The clinical trial itself was a major undertaking, involving more than one million children. Eight Indiana counties with the highest outbreak rates were involved, including Allen, Delaware, Elkhart, Howard, St. Joseph, Tippecanoe and Vanderburgh. The massive effort involved Americans at all levels of society from President Franklin D. Roosevelt, a polio patient himself and founder of NFIP, to the many employees at Eli Lilly and Company who were working furiously to rush the lifesaving vaccine to the public. The Indiana Historical Society invites guests to step into this crucial moment in history in the Indiana Experience exhibit, “You Are There 1955: Ending Polio.” Visitors get to become part of the action as Eli Lilly and Co. employees work to pack vials of Salk’s polio vaccine that will be eventually be shipped to devastated communities nationwide. 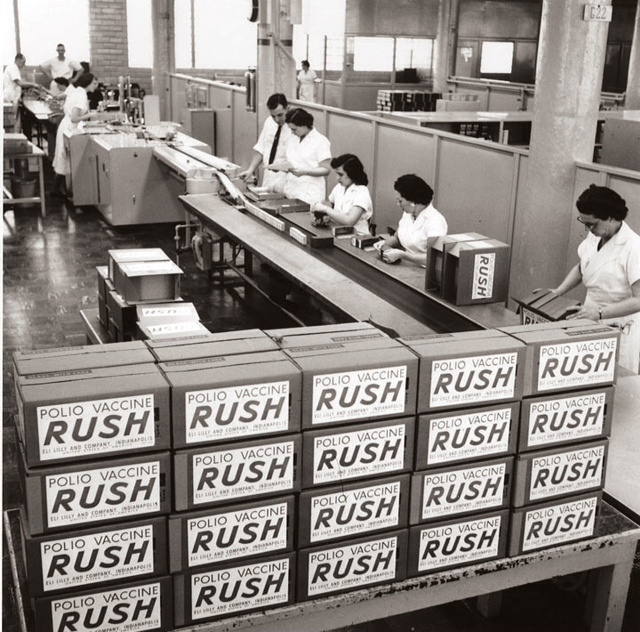 Visitors have a chance to interact with assembly line workers and learn how this Indianapolis company helped stem the tide of the polio epidemic in America. The exhibit is based on a photograph (above) taken on March 16, 1955, in Building 314 on the Eli Lilly and Co. campus, which shows workers packing vials of the vaccine and preparing them for shipment to the anxiously awaiting public. Two of the women pictured in the photograph, Janie Berry and Dorothy Redden, played a major part in making the exhibit come to life by sharing their experiences with IHS researchers. For these two former Lilly employees, a moment that now stands as a major historical turning point, was just a job, and one that they did each day for years in decade-spanning careers working at “Lilly’s.” “We just knew it had to get it out, that it was a priority,” said Berry. Having Janie Berry and Dorothy Redden as resources for the creation of the exhibit allows visitors to experience this major medical breakthrough through the eyes of two employees who were actually there. This article and a small portion of this website is sponsored by the Indiana Historical Society.